Scott's Web Log: You Read It Here First! On Monday, my readers may have caught my post regarding generic insulin. It seems my post was very timely, as the following article was published on the front page of this morning's New York Times. Just remember, you heard about it from me first! See my post from Monday for the full story. By the way, since its De-Lurking week, please leave a comment so I know who's reading and what brought you here! As they examine their state health care budgets, 11 of the nation's governors have identified one big-ticket item they think should cost less: insulin. The drug cost state Medicaid programs $500 million in 2005. And in the face of an epidemic of diabetes, the governors are asking why there is no cheaper generic version of a drug that, in one form or another, has been used since the 1920s. Rose McDaniels working at the Great Harvest Bread bakery in Jackson, Miss. She spends more than 10% of her income on insulin. Rose McDaniels is wondering, too. 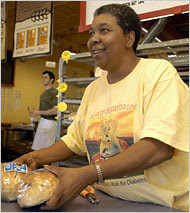 She is a bakery worker in Mississippi, the state with the highest incidence of the disease. The $115 a month she spends on insulin consumes more than 10% of her income. She sometimes cuts back her dosage to make it from payday to payday, though she knows the risks. "I'm trying to make it until the next available dollar I can spare," she said. The issue involves questions of politics and profits, as well as science. Insulin is caught in a commercial tug of war between brand-name drug companies that want to protect their franchises and generic drug makers that want to produce their own insulin products. Recently, each side has stepped up efforts to advance its side of the argument, and there are signs that Congress is ready to make life easier for generic drug companies. People with diabetes in this country, as well as government and private insurers, spend a combined $3.3 billion a year on insulin. Analysts say the price of insulin might drop by 25% if generic versions became available. Now, as the nation's diabetes rate climbs, political pressure is mounting on the Food and Drug Administration to open the door to generic versions. And Gov. Haley Barbour of Mississippi, a Republican, and 10 other governors have asked the F.D.A. to ease the way for generic insulin. "To have a lower-cost solution for our very large diabetic population is in the interest of the state and the interest of these people," Governor Barbour said. In Congress, some members see the generic-insulin issue as having implications for the nation's health care bill that go well beyond diabetes treatments. Insulin is one of the most widely used of a growing category of drugs known as biologics - medicines, made from living organisms, that are the fastest-growing segment of pharmaceutical spending. Many believe that if generic insulin is approved, that would open the door to development of generic versions of other, more complex biologics. Some include popular and expensive treatments for rheumatoid arthritis, cancer and other diseases that cost tens of thousands of dollars a year. The colorectal cancer drug Avastin, for example, costs $4,000 a month. Some generic drug manufacturers say that a first step would be for the F.D.A. to adopt guidelines explaining the testing and documentation that would be required for the approval of insulin. The 11 governors from states with high Medicaid spending on insulin are pressing for such guidelines, and generic drug manufacturers say they need them to proceed with applications for insulin. But the issue has been clouded by a series of regulatory delays by the F.D.A. The agency announced in 2001 that it was developing guidelines for approving generic insulin and human growth hormone, another widely used and long available biologic. Those guidelines have never been released, however, partly, critics say, because of pressure from the Biotechnology Industry Organization, which represents the brand-name makers of biologic drugs. The association argues that the same shortcuts to approval that are granted for conventional generic drugs are not applicable to biologics, even simple ones like insulin. Those shortcuts include an exemption from the long clinical testing required for approval of brand-name drugs. The trade group has been working to make sure generic drug companies cannot piggyback on the clinical studies done by drug innovators. The F.D.A. says that it is studying the issue, but believes that it is more appropriate to develop guidelines that would apply to all biologics rather than to issue guidelines for individual products like insulin and human growth hormone. The agency has said it will release a scientific background paper this spring that examines the issue. But Senator Orrin Hatch, a Utah Republican, and Representative Henry Waxman, a California Democrat, asked last year why the guidelines for insulin and human growth hormone had not been released. "There is simply no excuse - scientific, legal or otherwise - for the F.D.A. to delay the release of these guidelines," the lawmakers said in a letter to the F.D.A. As Congress looks for ways to reduce health care spending and broaden access to drugs, Mr. Waxman, who heads the House Oversight and Government Reform Committee, has said that legislation encouraging the development of generic biologics is one of his top priorities. Generic versions of conventional drugs typically reach the market soon after the 20-year patents have expired on the brand-name medicines they mimic. All the drug maker needs to demonstrate is that the generic version contains the same active ingredients, purity and quality, and provides "bioequivalence" - meaning it produces the same level of drug in the blood over time as the brand-name version. Long studies to prove safety and efficacy, which the brand-name manufacturers conduct to bring new drugs to market, are not necessary for the generic versions. Biologics, though, are made not from chemical recipes but from cultures of living material. And those who urge caution in the development of generic biologics - including the brand-name makers and many scientists - argue that the use of living organisms in manufacturing makes the drugs inherently variable and difficult to duplicate, and that patients could develop allergic reactions. One cautionary tale about the sensitivity of biologic production involves Eprex, an anti-anemia drug Johnson & Johnson marketed in Europe. There, during the late 1990s, a number of patients using the product mysteriously developed an allergic reaction called pure red cell aplasia. The company discovered that a minor manufacturing change in 1998 had created an interaction between the product and rubber stoppers used in syringes, causing the patients' reaction. Johnson & Johnson corrected the problem. Even makers of generics acknowledge that the approval process for generic biologics would be more complex than the current shortened process for conventional generic drugs. "The more complex the molecule, the more complex the risk," said Dr. Charles L. Cooney, a professor of biochemical engineering at the Massachusetts Institute of Technology, who said that the process would have to be tailored to each specific drug. But he argues that insulin is a relatively simple molecule that has been produced by several manufacturers. "I think that most people accept that fact, that some of the simpler molecules - insulin, human growth hormone - may require less testing to assure safety and efficacy," Dr. Cooney said. The nation's insulin market is currently dominated by three companies: the Danish manufacturer Novo Nordisk, the American drug maker Eli Lilly & Company and the French company Sanofi-Aventis. Of the five biggest-selling insulin products in this country in 2005, only Humulin from Lilly and Novolin from Novo Nordisk no longer have patent protection, with patents on the other drugs extending into the next decade. So the immediate impact of a generic version of biologic insulin would be competition for Humulin and Novolin, with combined sales in this country of about $1 billion. Yet, analysts say the arrival of competition can put price pressure on all brands. Novo Nordisk says it is opposed to any F.D.A. action that would approve generic insulin without clinical studies. Lilly, too, suggests that clinical trials should be a prerequisite to generic approval. "We believe the required clinical testing for follow-on versions of biological products such as insulin must be sufficient to assure that the patient will receive a safe and effective medicine," said Edward G. Sagebiel, a spokesman for Eli Lilly. But generic drug makers and people seeking lower-priced drugs say biologic insulin and human growth hormone have been in use since the 1980s, and their manufacture is well enough understood that there would be no need for extensive and costly trials that would raise the price. "These two drugs in particular were approved almost 25 years ago," said Mark Merritt, the president of the Pharmaceutical Care Management Association, a trade group that represents pharmacy benefit managers. "We're talking about drugs that are off patent, but don't have any price competition." Until the early 1980s, insulin was extracted from the pancreases of pigs and cows. In the early 1980s insulin became one of the first biologics, made by extracting the gene for insulin from a human cell, inserting it in yeasts or bacteria and growing them in a vat. Newer insulins, called analogues, are made by a similar process, although the genetic material is modified to make the drugs faster acting or longer acting. For patients who can make do with the older forms, Novo Nordisk makes a house-brand version of its off-patent Novolin that Wal-Mart, for example, sells as ReliOn for $16 a vial. That is enough to last a month for some people with diabetes, but many people find that their diabetes is better managed with more expensive insulin analogues. Ms. McDaniels, 48, the Mississippi bakery worker, uses two of the newer insulins, NovoLog by Novo Nordisk and Lantus by Sanofi-Aventis. And the $115 a month she spends is about the average monthly cost of insulin treatment in this country. If generic guidelines are set, there will be companies interested in entering the United States market, according to Kathleen D. Jaeger, president of the Generic Pharmaceutical Association. Two generic drug producers that currently sell insulin in India, Biocon and Wockhardt, are expected to file requests in 2007 to market it in Europe, where regulators have established guidelines for the approval of generic biologic drugs, including insulin. Barr Pharmaceuticals, an American generic drug maker, has acknowledged its interest in the insulin market. The only holdup to generic insulin is politics, according to Ms. Jaeger. "Our issue is, let science drive the system," Ms. Jaeger said. "It's the same science that the brand industry is using." Thanks for your interesting, and detailed, article the other day. I'd also like to see someone work on generic test strips. They're a significant cost, the technology is long in the tooth, there almost seems to be price fixing across the industry. Why are we paying $0.45 to $0.60 for strips that in some cases haven't changed for over five years? Surely the research costs have been paid off at this stage? I agree wholeheartedly on test strips, or for that matter glucose tablets and all the other stuff that feeds the cash cow known as diabetes. For that matter, I also question the "premium" charged for insulin pens and refill cartridges. At one time, Disetronic Medical Systems offered something called the Disetronic Pen, which was an "open" system that basically used reservoirs for their insulin pumps as cartridges that patients could fill for themselves. They discontinued the product a few years ago, but if it was still on the market, Symlin users would not have had to wait for Lilly to get its stuff together to have a pen device. All of these things suggest potential market opportunity for a motivated entrepeneur. Anyone interested in starting a business? Would you buy a used car from Dr. Cooney? It depends on what is meant by his statement. If the meaning is that no clinical trials are necessary as is the case with chemical drugs, the answer is no. However, I do not think full-scale trials are necessary, either. I would be satisfied with something closer to what Sandoz did with Omnitrope which was an "abbreviated" clinical trial on 51 individuals. The trial enabled them to prove that it would work as expected without having to spend millions on trials as if it was a completely new medicine, which it isn't. Hatch and Waxman are both planning to push this issue in Congress, so it will be important to see what their specifics on this legislation will be. Delurking to say, Amen to all this. I think it's criminal that the high cost of supplies puts MDI/pump therapy out of range of many people who would like to control their diabetes and avoid complications. Delurking week eh - funny! Ok then, I will leave a note! I read your site often, I am an information junkie! THANK YOU! I often visit your website -- it's great, very informative. Here's a letter I wrote to the NYT about the article on unbridled costs of insulin. But they never printed it! There are many challenges involved in getting cheaper generic brands of synthetic insulin to the market, some of which were addressed in today’s article (Bridling at Insulin’s Cost, States Push for Generics, January 11, 2007). One that wasn’t is that, while generic manufacturers reduce prices because they may be able to forego the costs associated with clinical trials, the original brand name synthetic insulins were, themselves, very poorly tested before coming on to the market in 1983, and the manufacturers failed to justify the higher prices they demanded. In 2003, the prestigious Cochrane Collaboration published a review of the scientific literature pertaining to synthetic insulin brands. It found that they were not more effective and did not improve the safety of insulin therapy when compared to much cheaper animal-sourced insulins introduced in the 1920s. The main difference was price: animal insulins, for example, sold in the United States for between $8 and $11 per 10ml vial, compared to $18 per 10ml vial in 1984. In addition, many patients required more of the synthetic insulin to control their blood sugars, thereby increasing the financial burden of the condition even more. Insulin users need affordable insulin. What we don’t need are more insulins, generic or branded, which fail to meet patient needs for improved quality of life, effectiveness and safety. Thanks for your comments, Colleen. Its too bad the Times never published your letter, although in my experience, they publish so few of the thousands of letters they receive for each article, but its still worth sending them ... some do get published! Well maybe the solution is for the insulin makers to stop over charging and lining their pockets. I always pop in to read your posts, alot of great info. Keep it up!